Fittings of IdealGuard™ products can be accomplished by DIY by following Fitting Instructions that come with the product or a professional, such as a joiner/carpenter/handyman/builder/locksmith, should be able to do the work for you. Fitting by the professionals can be undertaken on a fast track basis into occupied housing of all types without decanting residents. IdealGuard™ products are maintenance-free. Only occasional wipe clean with a damp cloth is enough to keep the products looking as good as new, for life. The products will remain a long-term maintenance-free assets to your property. IdealGuard™/U, IdealGuard™/L and IdealGuard™/S models are high quality home and business premises improvement products suitable for fitting indoors as a letter box to a mail slot, which is arranged in a structure, such as a door or a wall. The structure thickness can be in the range 35-140mm. The mail slot can be located at any height above the floor: at door bottom (low-level) or anywhere higher, often at door centre (high-level). If there is no mail slot in the door, it can be made as usual. If your door already has a mail slot (a letter plate), all you need is to replace the existing letter plate with the matching 4x12" Victorian letter plate instead. 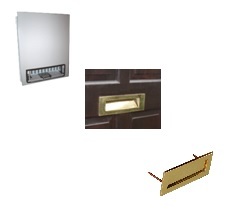 Most existing mail slots are small, so in this case the size of the existing mail slot aperture has to be slightly increased to allow the matching letterplate. In hollow doors, like UPVC and metal, the mail slot must be sleeved (sealed or filled around inside) to stop the elements entering into the door cavity. There is a choice for the matching 4x12" Victorian letter plate finish on the market. We normally stock Polished Brass Lacquered and Chrome plated letter plates, which you can order with the product. Alternatively you can order IdealGuard™ without a letter plate and source the matching 4x12" letter plate with the surface finish of your choice on the market. IdealGuard™ letter box is fixed indoors to the threaded rods of the letter plate. This way the door is sandwiched between the letter plate and IdealGuard™ letter box product and there is no added damage to the door structure. If required IdealGuard™ products also allow using screws for fixing. 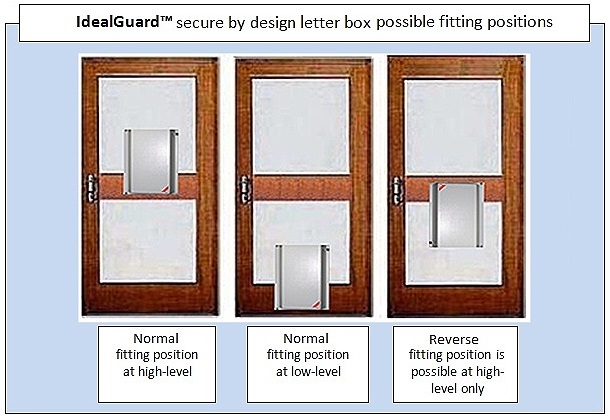 At high-level also possible fitting IdealGuard™ letter box product in reverse position. In this case the capacity for mail will be increased twofold, but at the expense of reducing the special security feature against introduction of liquids. 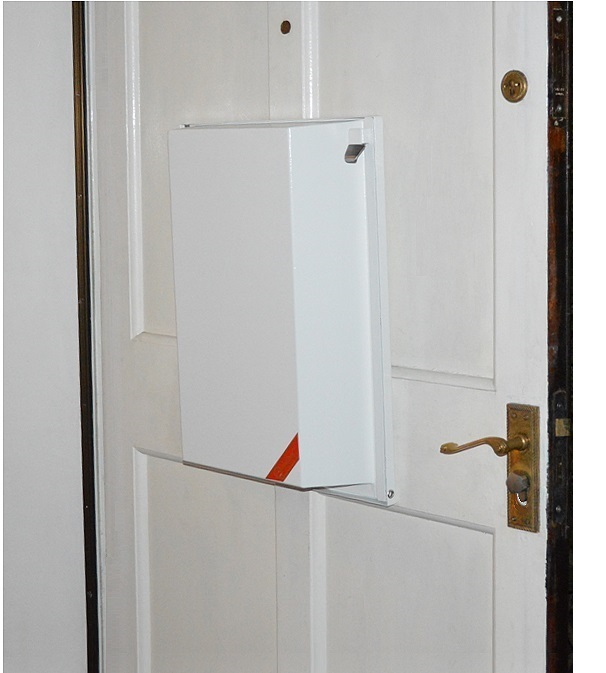 Why IdealGuard™ letter box is compliant to Building Regulations 2010 Part M (Access to and Use of Buildings)? 16.5.4 Direction of opening The door leaf of any doorway or exit should, where reasonably practicable, be hung to open in the direction of escape, and should always do so if the number of persons that might be expected to use the door at the time of a fire is more than 60. In any case doors are secured by hinges to the vertical portion of the frame called jamb. Jamb and the gap between the jamb and the wall rough opening are covered by casing. Casing is the edge trim around door openings. 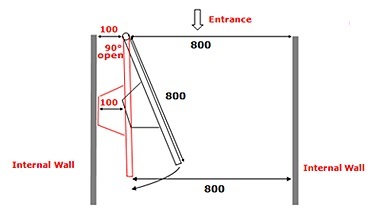 Where in compliance with BS 9999:2008 the external door opens outward it should swing beyond 90° at least in order to fulfil the Building Regulations 2010 Part M requirement. Usually it swings well beyond that and when it swings beyond 110° (as shown on the picture) fitting IdealGuard™ secure by design multifunctional eco letter box would not reduce the door clear opening width. In all cases where the door opens inward and the width of the casing is 100mm (4") or more on the hinges side the fitted IdealGuard™ letter box will not affect the door clear opening width as it fits into 100mm space. Usually this is the case. 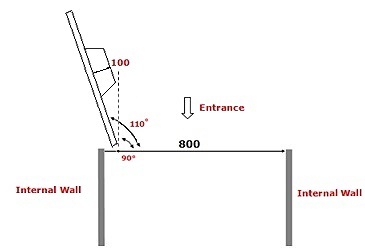 If the width of the casing is less than 100mm plus the passage way into the property is narrow there may be some reduction in the door clear opening width. In most cases this should not be a problem since minimum effective clear width of doors 750mm (in existing buildings) and 800mm (in new buildings) allowed by the legislation can be achieved still. If not then the solution can be by choosing a wider than 800mm door. To view the examples of letter box fitting click Examples of Fitting. 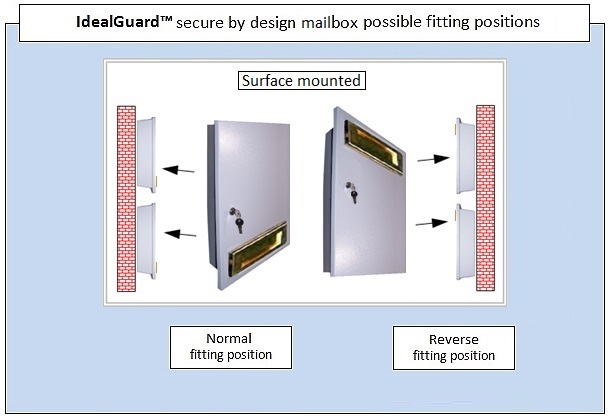 IdealGuard™/U and IdealGuard™/M secure by design multifunctional mailbox products can be surface mounted, recessed or fitted on a stand. Depending on the structure where you want to fix the mailbox we recommend using M5 or M4 non rusting fixing screws or bolts with nuts.